How Technology is Transforming the Retail Game? How franchise model is fueling growth in Spa Culture of India? How Startups Are Redefining Indias Bespoke Clothing Segment? How AI is strengthening omnichannel analytics in Indian Retail Sector? How mSFA technology is leading the change to drive better productivity in retail industry? towards organised retailing formats with key players in retail sector...Hurry! 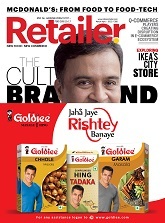 to get valuable insights of Indian Retail Industry for free.